Updated Nov. 19, 2016 at 10:10 am: The TTC has updated their comment on the status of the service improvements implemented in 2015-16. The Star’s Ben Spurr had an article on November 18, 2016 about the degree to which the TTC fails to meet its own service standards for vehicle crowding. The many debates about budget and service routinely ignore the question of whether the TTC actually meets the Board-mandated standards, and instead we are treated to complaints from the budget hawks about poorly performing services. In my review of the proposed 2017 operating budget, I noted that the traditional targets of such complaints do not offer much latitude for savings, while much more money is on the table from potential reductions of service quality and reversal of the recent Tory service improvements such as the 10 minute network. 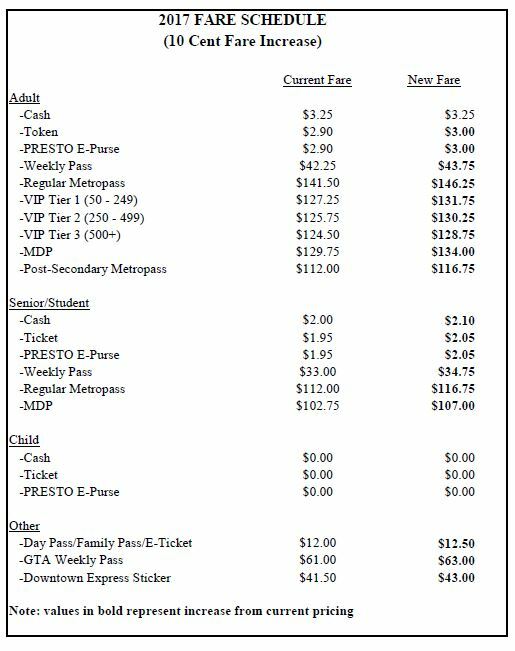 The TTC has provided the detailed list it sent to Ben Spurr, and here it is. The list comes with various caveats from the TTC, notably that many of the routes that are “over” the standard are only slightly past the line by say a few passengers over the target. In a nutshell, 43 of the TTC’s bus and streetcar routes exceed crowding standards at one or more periods during the week and on weekends. In most cases, though, the average number of passengers per vehicle is only slightly in excess of our crowding standards…one or two people in some cases. Vehicles that are bunched often have extra space on the second (third, etc) vehicle because everyone boards the “gap” vehicle. A strong inventive for this behaviour is that dropping back to a following, less crowded vehicle may leave the rider turfed off when it short turns. Despite TTC claims that total short turn counts are down, this remains a problem and rider behaviour reflects their experience. The number of vehicles per hour operated is not always the scheduled value. Therefore the actual capacity of the route could be less than advertised. On routes with articulated streetcars or buses, regular single-section vehicles can often be found in place of artics. The result is a loss of capacity and greater than scheduled crowding. Past observations by TTC planners have rather quaintly observed that the cheapest “new” capacity one can provide is to operate reliable service so that loads are evenly distributed. I leave it to readers to contemplate the degree to which the TTC achieves this, especially when it has a six-minute wide window within which vehicles are “on time”. For frequent routes, vehicles in pairs can be on time even though they provide gappy service. This is a very long-standing problem, compounded by the fact that the TTC does not even regularly meet its rather generous “targets” for headway reliability. I asked the TTC how the average loads are calculated as reported in their tables. Specifically, is the average calculated based on the observed number of vehicles, or on the scheduled service, and is the percentage of load based on the scheduled vehicle type rather than what actually operates. The TTC replied that the capacity used to calculated the percentages is based on scheduled values and vehicle types, not on the service available to riders on the street. This is an important distinction for routes with erratic service and frequent replacement of large vehicles by smaller ones, notably 501 Queen. It is quite possible that the actual average loads considerably exceed available capacity even though they may fall within theoretical values based on the schedules. What may look like a seated load on paper could well have a considerable number of standees because headways are wider and/or vehicles are smaller than planned. What is the actual capacity of the service operated against which the crowding values are calculated? How variable is the headway (maximum and minimum values, percentage of vehicles close together, etc.)? The specific decisions on when and where to adjust service to these standards are made by TTC staff. In a typical year we make more than a hundred service changes. We regularly conduct reviews of ridership to assess needs across all routes. If there is a route that needs some additional service, we will try to balance that against a route that may have capacity to spare. In a large, busy system such as the TTC’s there are always some routes at any point in time that have crowding that exceeds the crowding standards. And while we would obviously prefer our customers are not on crowded vehicles, we have to balance the availability of resources like vehicles and operators with delivering service to the entire city. Through regular service reviews and with arrival of the new vehicles, there is an opportunity to increase capacity on some of the busier routes like the 504. In particular the TTC’s new high capacity low-floor streetcars will assist in reducing overcrowding on our streetcar routes. There’s a bit more to things than this reply lets on. Every year there is a “Service Budget” (the one for 2017 was probably set a few months ago), and Service Planning works within this to allocate service to the available resources. However, a critical component is the number of available operators and this runs into the dreaded budgetary problem of “head count avoidance”. In off peak periods, routes may cry out for more service, but vehicles will sit in the yards if there is nobody to operate them. 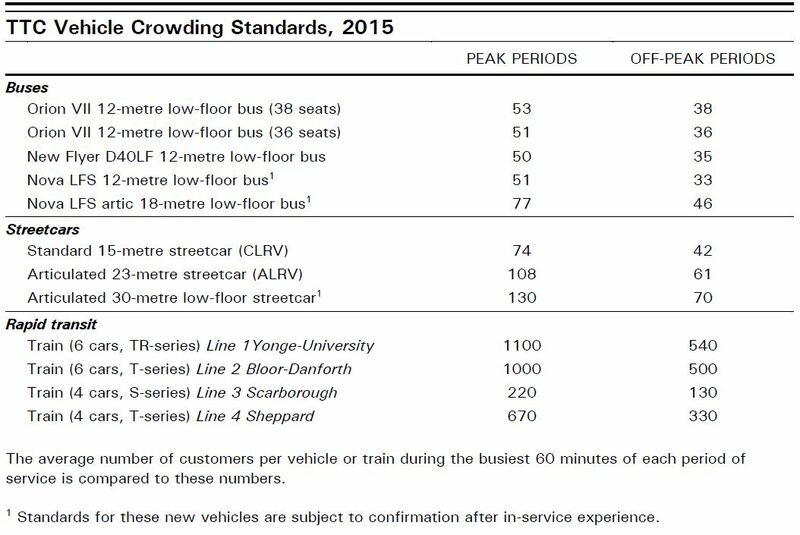 Yes, the TTC’s new cars will help to reduce crowding when and if they actually arrive, and when they start operating on really busy routes like King. On 510 Spadina, the introduction of low-floor cars was accompanied by a cut in the number of vehicles in service, although the net change remained an increase in capacity. This has long been an issue in plans for fleets of larger vehicles because in some cases, notably the conversion of bus routes from regular to articulated vehicles, the “new” service has roughly the same capacity as the old by the simple expedient of running two artics where there previously had been three regular sized buses. Years ago, the same fate hit the 501 Queen car, and service quality (not to mention ridership) has never recovered. 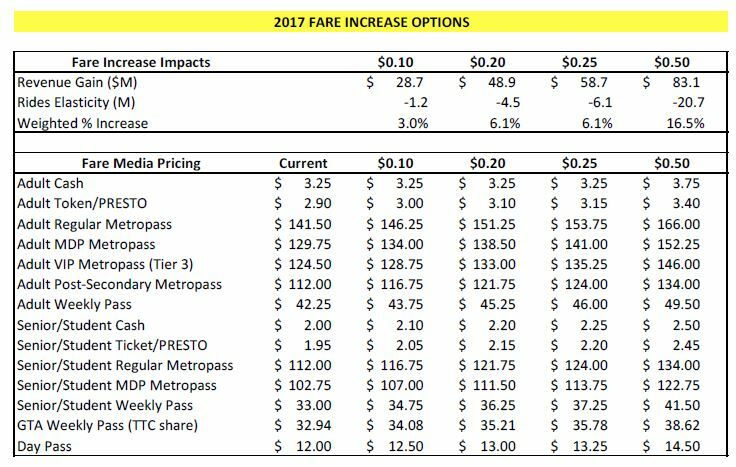 Going into a year where the Service Budget is planned to rise only by 0.4%, there is not much headroom for more capacity, and anything added on one route will inevitably be taken from another. This may be “efficient”, but it runs headlong into policy objectives such as the core network of 10 minute services, all-day service on all routes and the existing crowding standards. As the budget report showed, there is not much available to trim from the lightly loaded routes when resources are needed on busy routes elsewhere, and the more likely situation will be to pack in more riders. The problem is even worse if the TTC contemplates relaxing the standards so that average loads on vehicles will rise. We already know from experience that many routes are crowded, and the last thing they will need is less service and even worse travel conditions. The table shows broad categories that generally would reflect the reversal of service initiatives implemented in 2015. The specific service changes within each category have not been identified. Identifying the specific routes which would be affected would be done in 2017 following a review of the initiatives implemented in 2015-2016. What a marvelous way to short-change debate – don’t tell people what the actual effects might be. This is precisely the sort of campaign one would expect from an anti-transit Council or Mayor who would say “this won’t hurt too much”, or so a Councillor could claim they never knew the details of what was planned before it happens. Will someone on the TTC Board please make an official request for the details before this goes to Council? On a more general note, the primary function of the TTC is to provide transit service. The Board sets policy and sits back expecting that service actually operates within those parameters. However, there is always a Catch-22, the caveat in any policy “subject to budget availability”. This allows the Board to pass a policy promising the sun, moon and stars to transit riders, but it’s ok if staff only delivers a few minor planets in a far-off galaxy because they couldn’t afford to deliver more. Meanwhile, Council blithely approve billions in spending on capital projects. This is not to say that those capital projects are unneeded (that pitched battle has been debated elsewhere), but it is a double standard to treat capital funding as something we must do as an integral part of city growth and prosperity while at the same time starving day-to-day service because keeping taxes down is the paramount goal. Every month, we see a CEO’s report from Andy Byford full of beautiful pictures and graphs, but with very little commentary on the basic question: are we providing the service that Toronto needs, and if not, what do we have to do to achieve this? It’s all very well to have customer surveys and indices of station cleanliness, but what about the actual service on the street? Is the plateau in ridership related to the system’s inability to carry more riders or to attract business? 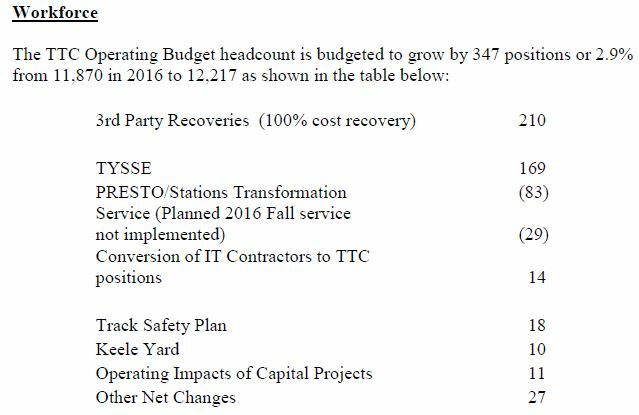 TTC staff are supposed to be producing a new Ridership Growth Strategy for the TTC Board in January. It’s a shame this wasn’t produced as an integral part of the budget. How bad is the service today? Where can it improve? How much more would be possible and at what cost? Those are questions no penny-pinching Mayor wants asked let alone answered. In a few days, the TTC Board will consider its 2017 budget, and we will see just how much appetite there is for forcing Council to cough up the money needed to run the transit system, to pay for all those photo ops a few years ago when John Tory claimed he would reduce the damage wrought by Rob Ford. … a resident of the King/Sumach area … commented that the screech of the streetcars turning at King and Sumach was so loud as to prevent sleep. Apparently the issue has been ongoing since the inauguration of the 514 (Distillery Loop–Dufferin) line on June 19. Deputy Mayor and area councillor Pam McConnell’s office was aware of the issues and noted that streetcar service was now suspended (replaced with shuttle buses) between 10 p.m. and 7 a.m. A public meeting was subsequently scheduled with the councillor’s office and the TTC. When the TTC began rerouting the 514 service late in the evening, the alleged purpose was “railgrinding” and this is still reflected in the URL for the service notice which is called “514_railgrinding.jsp”. The activities underway at the intersection were clearly aimed at the derailment problems by altering the rail profile on the curves. There is a long-standing slow order for east-west operation on King that has nothing to do with this, but is no doubt related to a few cases of overhead failure. Meanwhile, the traffic signals here and at other locations on Cherry appear to be on a fixed cycle that has no relationship to whether transit vehicles are present. So much for “transit priority”. On the subject of wheel squeal, the TTC’s official line is that the new streetcars are supposed to be self-lubricating, and that this would be triggered by GPS information. That’s a good line, but it does not fit with actual conditions. There is a wheel greaser on the southbound approach to Distillery Loop. Most of the service on 514 Cherry is provided by CLRVs that do not have automatic greasers. 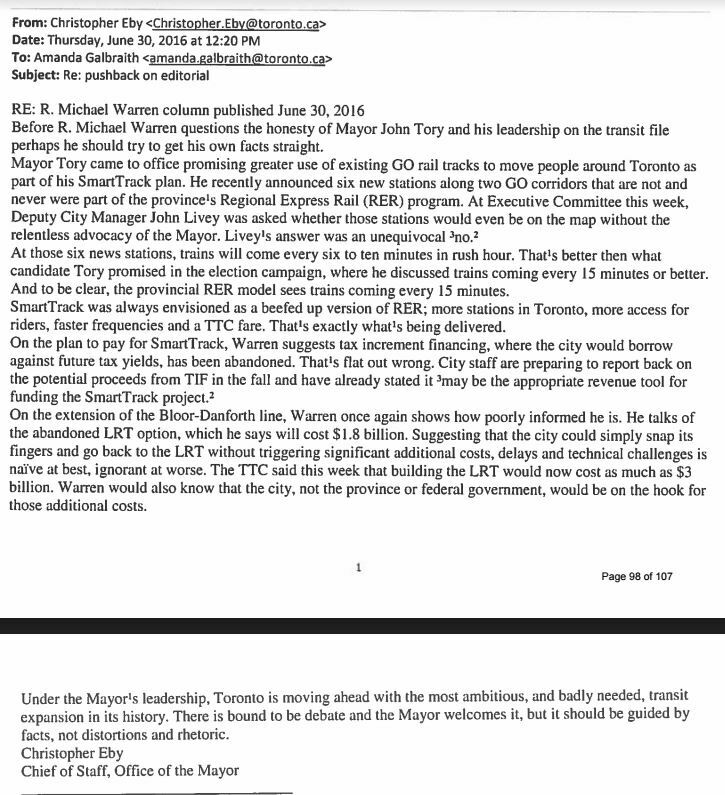 I have outstanding requests for further information on these issues to both the TTC and to City Transportation, and will update this post as and when they reply. The TTC has launched a page with detailed descriptions of proposed route changes that would take effect when the Spadina subway extension to Vaughan (a.k.a. Line 1 TYSSE) opens in late 2017. This includes a survey of riders what they think of the new routes. The map below is taken from the TTC’s site which has much more detailed descriptions. Note that the station now known as Downsview will be renamed Sheppard West, and the next station to the northwest will be called Downsview Park. Pioneer Village Station (previously known as Steeles West) will be a major hub as the terminus for many TTC routes in this area. Some routes will continue to operate through York University, but its function as a terminus will be replaced by the new subway station. All service now provided by the TTC north of Steeles Avenue will be replaced by York Region Transit operations plus the new subway. 105 Dufferin North will be cut back to end at Steeles Avenue. 35 Jane will terminate at Pioneer Village Station, and the 35B service to Black Creek Pioneer Village will be replaced by an extension of 108 Downsview. 195 Jane Rocket will terminate at Pioneer Village Station. 108 Downsview will be extended north to Pioneer Village Station replacing the 35B service. 41 Keele will be extended through York University to Pioneer Village Station. The 41B service to Petrolia and Canarctic will be replaced by 107 Keele North. 107 Keele North will be cut back to Steeles and will terminate at Pioneer Village Station. The 107B service via Chesswood will be replaced by 117 Alness. 117 Alness will be shifted off of Dufferin/Allen to replace the 107B service in the area between Dufferin and the GO Barrie corridor. 84D Sheppard West to Oakdale and Norfinch will be extended to Pioneer Village Station. 196 York University Express will be replaced on Sheppard by an 84E Express service from Yonge to Sheppard West Station. Service to York U is replaced by the subway. 106 York University will be modified by the replacement of the large loop around York U campus with a run through to Pioneer Village Station. 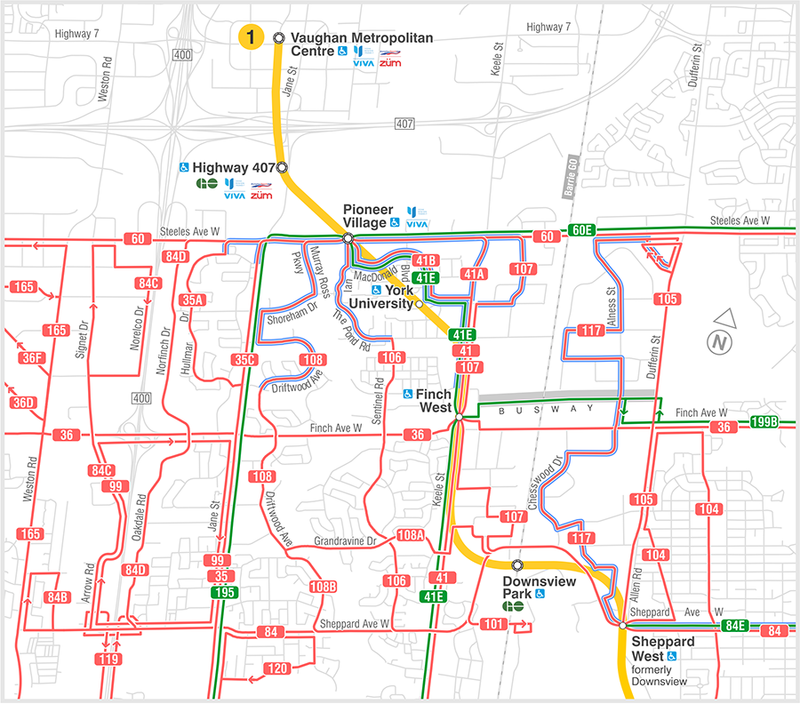 Overnight services on 335 Jane, 341 Keele and 353 Steeles will now loop around the York U campus rather than only serving the existing bus terminal at the Common. 60 Steeles West will connect with the subway at Pioneer Village Station, but will not operate into the York U campus. 199 Finch Rocket will be cut back to Finch West Station rather then operating to York University. 36 Finch West will operate through Finch West Station. Please leave comments about these changes in the TTC’s survey. Ever since Mayor Tory’s election campaign, we have been told that SmartTrack is a something-for-nothing project that would bring vastly improved transit service to Toronto at little or new added cost to taxpayers. This would occur through the hocus-pocus of Tax Increment Financing TIF). For those new to the subject, the premise here is that building a new transit line causes property values to rise and new development that would not occur in the absence of the transit investment. That generates new tax revenue that could be used to pay off the construction debt. However, the city’s staff, who are bending over backwards to make Tory’s transit plans workable, do not see TIF as coming close to paying for Toronto’s share of SmartTrack. The election premise was that SmartTrack would be built at a cost of $8 billion, would provide a total of 22 stations and frequent service over a route from Markham to the Airport Corporate Centre (south of Pearson Airport). This would be shared equally by all three levels of government making Toronto’s share about $2.7 billion, if one believes the premise of the campaign. The situation has changed over the past two years. The Eglinton branch of SmartTrack as a railway operation was never a good idea, and it has reverted to the original LRT proposal from Transit City. Tory takes advantage of the more closely-spaced stops on the LRT to bolster his SmartTrack station count. In fact there would be more new LRT stations than SmartTrack/GO stations as the plan now stands. City staff argue that the benefits available from “value uplift” of existing properties will be low, and they have not included this in their calculations. From new development, the added tax revenue would be $857.1 million over the life of the financing scheme, and to be conservative, staff recommend that only half of this be presumed for SmartTrack financing. This calculation does not address how the services new commercial or residential development will require would be financed if some or all of their new tax revenues were dedicated to SmartTrack. 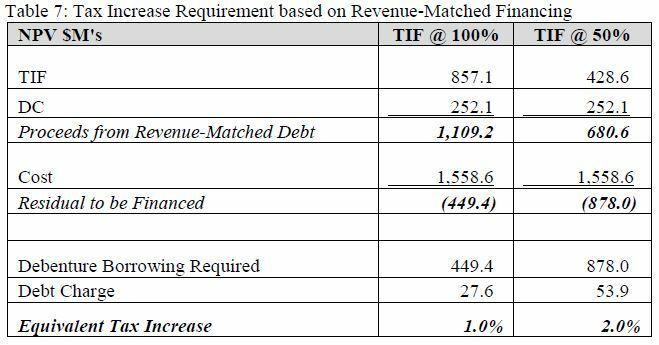 The chart below shows the considerable spread between TIF and Development Charges (DCs) revenues and the actual requirements for SmartTrack financing, including the LRT line on Eglinton from Mount Dennis to Renforth. To put this in context, SRRA was co-founded by Iain Dobson who was an advisor to Tory’s election campaign. In May 2014, just as the SmartTrack campaign started, he was appointed to the Metrolinx Board during Glen Murray’s final days as Minister of Transportation. The consulting contract was awarded by Council on a sole source basis. When SmartTrack was proposed, the intent was to improve access to areas of potential development. The following map shows these areas and their relationship to the SmartTrack corridor. Several of the nodes lie outside of Toronto or far from the SmartTrack corridor (blue line and circles). 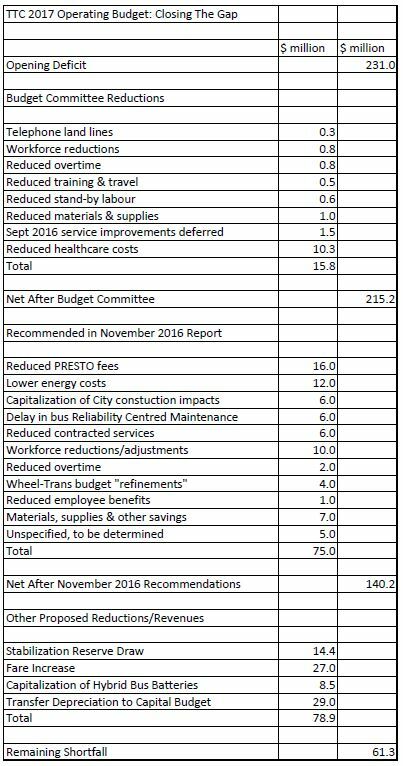 These will either not produce new tax revenue within the 416 or they are too far from ST to benefit from its construction. A vital question, then, is whether the amount of development contemplated in the January 2016 SRRA report and resulting tax revenues will actually flow to the city. SRRA’s analysis begins with a map of the “TIF Zones”, the areas around stations where tax increases could be expected. Many of the stations are existing or planned GO stops that will see added service without any SmartTrack investment, and ST adds nothing to them (Milliken, Agincourt, Kennedy, Main, Union, Bloor, Mount Dennis). The map also shows a station at Spadina that will not be part of the upgrades planned for the ST corridor. Although many zones are shown, most of them will not be affected by SmartTrack as it is now proposed, merely the addition of six stations to the GO Transit map: Finch East, Lawrence East, Gerrard, East Harbour (Lever), Liberty Village and St. Clair. Although the SRRA report discusses the methodology for analysis of the effect of SmartTrack in the TIF zones, it does not provide a dollar value for the actual tax increments this would produce, nor a description of how this might be calculated. Numbers cited in the City report imply that a more detailed breakdown exists for the SRRA data, but that it has not been published. An important component of the stimulus attributed to SmartTrack is the construction of additional residential units because ST would make jobs in the outlying centres (notably Markham and the airport) easier to reach and thereby allow reverse commuting. However, there is no “ST service” per se, only the provision of stops where riders might board GO RER trains running less frequently than original claims for ST itself. Projections for employment and residential growth are shown in charts. 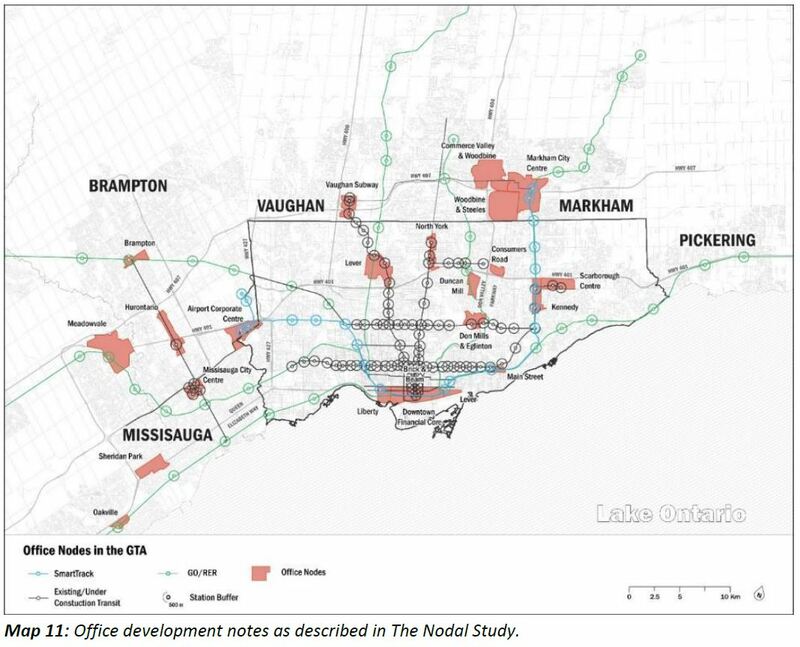 The core area remains the primary location for employment growth, although the projection with SmartTrack diverts some of this to other areas, notably the Queen/Carlaw area (i.e. the Lever site) and Liberty Village. The latter is a bit of a stretch because the station would be located at the northeast end of the district while commercial development, such as there may be, will be toward the southwest. An important distinction here is that in the “secondary zones” (those along transit corridors other than ST) and in the non-TIF part of the city, the projected employment with ST is generally lower than if ST exists. In other words, potential development that might hold these employees shifts into areas where it contributes to projected TIF revenue. A similar situation applies with residential units. The city adjusts for this numerically in their backgrounder on City Funding and Financing Strategy. What is not clear, however, is which of the TIF zones are included for this analysis, in particular those which are at existing GO stops, nor whether the effect of ST’s having no marginal service beyond that provided by GO RER has been take into account. 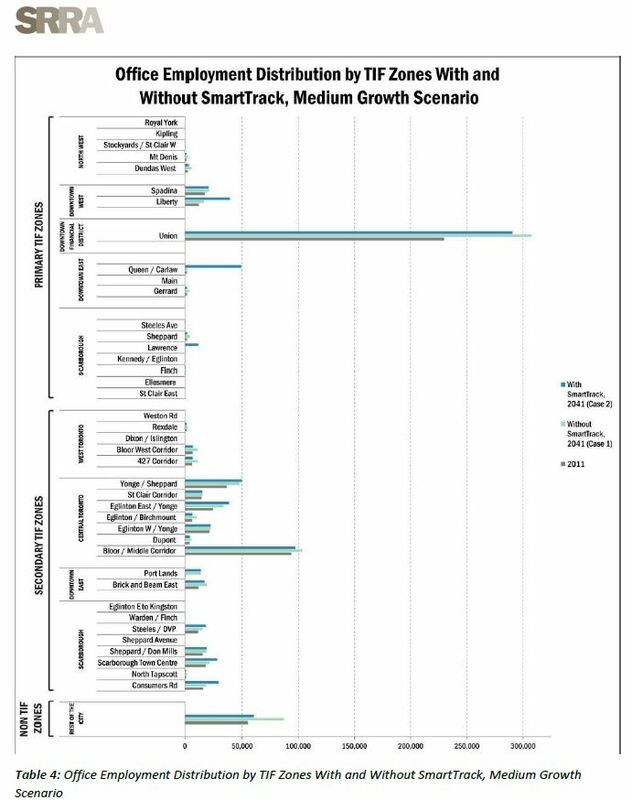 If all zones were included, has the potential revenue due only to SmartTrack been overstated? There is a more general problem with DCs in that they affect every new building in the city, not just those along the transit corridors. Developers who do not benefit from the projects these charges help to finance are not enthusiastic about building yet more costs into the base borne by would-be purchasers. 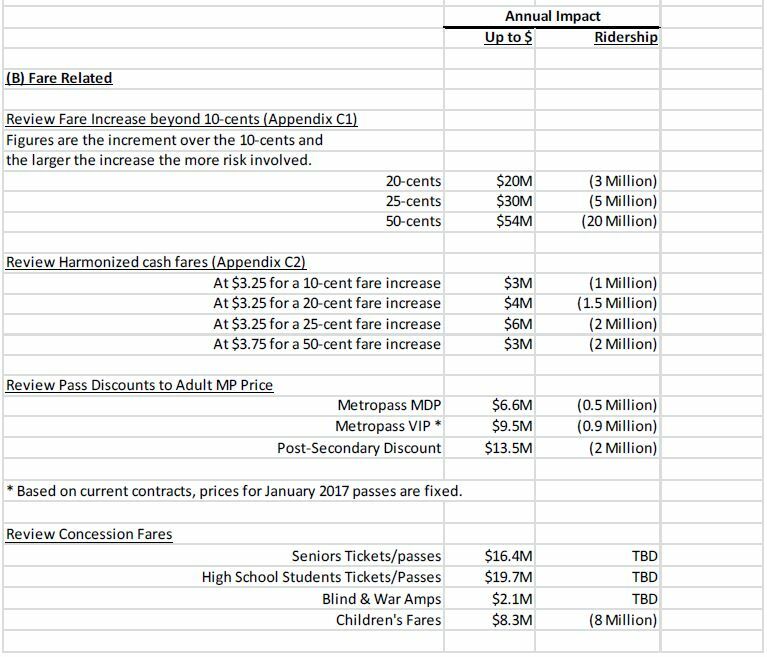 All of this raises many questions about the validity of the calculated TIF revenues available to finance the SmartTrack scheme. I have sent queries about this to City staff, and await a reply. This article will be updated when more information is available. Council will debate the SmartTrack reports at its meeting beginning on November 8, 2016. Here, in brief, are my questions. The staff presentation to Council expresses commercial growth in thousands of square feet while SRRA uses employment. These can be converted to each other with a ratio, but what number has been used? How do the City numbers relate to the SRRA values? The bar graphs in SRRA’s report do not include actual values making direct calculations such as selective inclusion or exclusion of TIF zones difficult. What are the numbers? 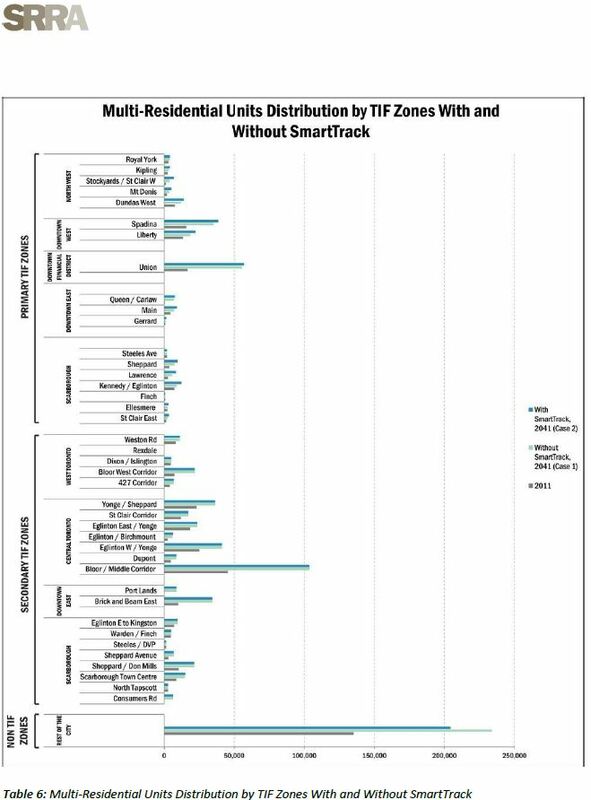 Which TIF zones were used for the calculations in the City presentation? Only the six the City is paying for, or zones at all “SmartTrack” stations even though many of these are GO RER locations to which ST will not add any service? What adjustments in projections have occurred between the original SRRA estimates and those used in current City estimates? As with TIF, have DCs been calculated only based on the six added “City” stations, or for all of the ST/RER locations? TIF revenue is projected to grow uniformly and across all included zones. Is this a realistic assumption, how much growth is projected in each zone, and when is this expected to occur? If the SmartTrack tax were implemented at the same rate across all property classes, at what level would the tax be set?